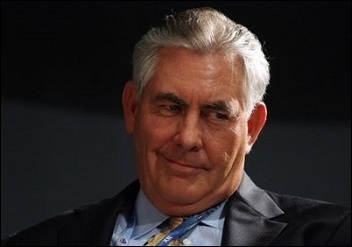 Rex Tillerson, the secretary of state-designate, is the mysterious cabinet nominee of President-elect Donald Trump's, for his long career at ExxonMobil Corporation has revealed next to nothing publicly of his views where the United States stands in the world. A glimpse of Tillerson's views has now appeared in an obscure source: Herb Jackson of NorthJersey.com reports on the 75-minute meeting of Sen. Bob Menendez (Democrat of New Jersey and a member of the Senate Foreign Relations Committee,) with Tillerson on Jan. 5. Menendez recounted their conversation about U.S. relations with Turkey after Tillerson stated he hopes to "bring them back into the fold." Menendez: "Does this mean we are willing to accept authoritarian figures and dictators as part of our foreign policy?" Tillerson: "Well, we've dealt with dictators in the past." Menendez: "Yeah, and we've faced the consequences of dealing with them," adding to the reporter that he found Tillerson's response to be "concerning." "He basically said, I don't know a lot [about Cuba], and I need more time on that." ... Menendez said Tillerson said he knew there were strong arguments on both sides of the Cuba issue, but he only discussed the points made by those who support removing restrictions, so Menendez told him about journalists and dissidents who are being oppressed today. "I'm a little alarmed because obviously as the secretary of state, you're going to have to know your audience when you are engaging them, and to come meet me and not to have an idea, a more thorough idea about what U.S.-Cuba policy should be means you don't know your audience. He's a very nice man and he's smart, but I would say ... there's not a lot of depth here in terms of U.S. foreign policy, there's broad strokes." In Jackson's paraphrase, Menendez noted that he "did not feel that Tillerson had a clear idea of Trump's policy views other than defeating the Islamic State." (1) The response on Turkey sounds in line with those of Michael Flynn, who's in line to be the national security advisor. (2) The ignorance of the Cuba issue points to a larger problem – limited knowledge of the outside world. (3) The focus on ISIS fits what Trump has been saying. (4) How an amateur president and an amateur secretary of state together will guide a great power's foreign policy will be, to say the least, interesting to watch.